I feel like I remember seeing these beautiful recycled bubble terrarium bottles at http://www.iloveuma.com but haven't seemed to post about them yet. Thanks to Dana K. for the great tip! 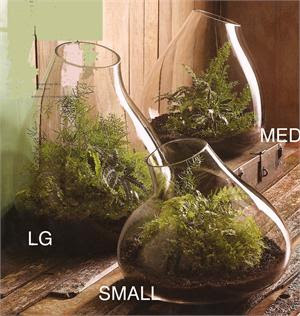 The bottles are certainly unique and would make a great terrarium but take note folks- plants are not included with these puppies. It's a do-it-yourself job. Great shapes and they would make lovely vases too.